Amer Fort Jaipur India is a place no one should miss visiting. It is located in Amer, a town with an area of 4 square kilometers located 11 kilometers from Jaipur, Rajasthan state, India. Located high on a hill, it is the principal tourist attraction in the Jaipur area. This magnificent fort is largely made up of a royal palace, built from pale yellow and pink sandstone and white marble, and divided into four main sections, each with its own courtyard. You can trudge up to the fort from the road in about 10 minutes, but riding up on elephant back is very popular. 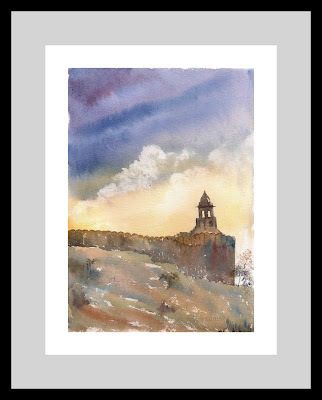 Size: 8.25" x 11.75" watercolors on handmade paper from a photo I took during my visit to the Fort, showing one of the watch towers. Your sky is so wonderful! And I love the colors mingling in the wall. Lovely work Asha!